It’s no secret that children are curious and have minds of their own. So when you take them out to the yard or garden, it’s important to realize that you may not complete all the tasks you have planned. Kid’s early outings should be about exploration. Don’t plan any major goals for the day. Instead, let your child enjoy a positive, fun first experience. By working in a garden, children can experience the satisfaction that comes from caring for something. They develop a better appreciation for nature and the earth itself. Young children, especially preschoolers, love to dig in the dirt. Digging can be a rich leering experience. Soil is rich, moist, and full of fascinating discoveries, like roly-poly pill bugs, wiggly worms, and other small creatures. Carry a magnifying glass and guide your kids through a gentle, close look at some of this “wildlife”. Hands-on-learning, no matter how small, is an opportunity for your child to learn and contribute. When you involve your children in gardening, they learn about the cycle of life and see plants as a source of food. 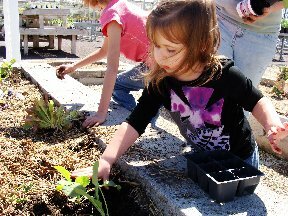 A garden is a natural classroom, and exposure to it can only enhance a child’s appreciation for the wonders of nature. Indoor gardening can also provide valuable shared experiences. Beans, sprouts, radishes, cherry tomatoes, and sunflowers deliver fast rewards for young gardeners. Kids get most excited when seeds first germinate, and again when you can plant them in a bigger pot or in an outdoor garden. Who we are and what we enjoy as adults often stem from our childhood interests. It makes sense to encourage this wholesome, healthy pastime that can grow with kids. So whatever your children’s ages, take the opportunity to nurture their green thumbs—-cherished memories are sure to blossom.